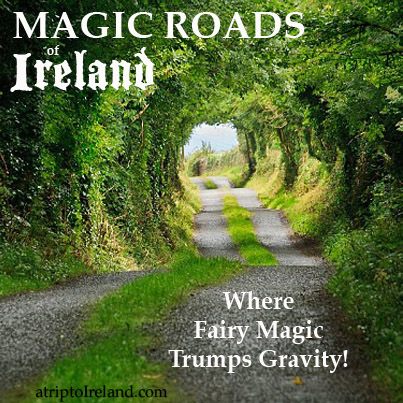 The Magic Roads of Ireland: Where Fairy Magic Trumps Gravity! There are weird and unearthly places where the known laws of physics do not seem to apply. Naturally, Ireland has more than its fair share of them. My first memory of the “fairy hill” phenomenon is as a child, reading an Enid Blyton novel in which there is a hill on which all cars stutter to a stop. Another such phenomenon is the fabled river where water runs upslope (such as at Fore Abbey) or the road where a car will roll uphill. There appears to be one of these oddities in most countries. (I came across a stream in Western NC many years ago that appeared to flow uphill — but strangely I’ve never been able to find it again.) Needless to say, Ireland has several of these magical spots, in fact Ireland appears to have more of these gravity-defying wonders per square mile than any other country. One, known locally as “The Magic Road” or “Magic Hill,” is in Co. Louth, near the Long Woman’s Grave in the Cooley Mountains. The American actor-turned-TV-presenter Andrew McCarthy recently featured this stretch of road on his show (video below). The Cooley penisula is an area of long association with legends and magical folklore. Much of The Tain takes place here, there are several neolithic tombs in the area (including the highest one in all Ireland on Slieve Gullion), and one of the oldest churches in the country is nearby at Killevy. Oddly, the agencies responsible for promoting the Ring of Gullion make no mention of the “Magic Hill” in their pamphlets, but then again, hordes of tourists stopping on a back road to try and make their car roll uphill really has disaster-waiting-to-happen written all over it. The folkloric explanation for these magic spots appears to be that you’ve trespassed on sacred fairy land and the Fey are pushing you away. This makes me wonder if the phenomenon was well-known before cars came on the scene, or if this is just another example of our love of yarn-spinning. Did horses get pulled back upslope by their wagons if they idled to nibble the grass in the same spot? The Mahon Falls waterfall has a couple of different explanations doing the rounds according to locals. One blames the local council (politicians are second only to the English for being made scapegoats for any ill in Ireland) for building a road through a fairy glen in order to bring turf from a nearby bog. The fae then cursed the road in revenge, causing everything to go in reverse, and preventing the cut turf ever leaving the bog. However, some of the turf must have been removed from the bog somehow, because in 1943 a large load of this turf was delivered to Ballybricken Jail in Co. Waterford. On the night of March 3rd, the old wall of the jail collapsed, killing 10 people. Some attribute the infamous Waterford jail disaster to the fairies curse. Another, more scientific-sounding theory seems to appeal to younger generations less interested in fairy stories: this is that there’s a huge seam of copper under the road, and that this magnetically pulls the cars back uphill somehow. The more rational-sounding explanation is quite simple: these are actually optical illusions. The roads only appear to be going downhill because of the surrounding landscape. The distant horizon is not visible at these spots, so the eye takes its cues for what is a flat surface, an up- or a downslope from the relationship between the visible landforms. These two roads appear to be going downhill, but really they’re each a gentle upslope, so when you stop your car and remove the brake, gravity takes over and pulls you gently backwards down the slope, even though to onlookers you appear to be traveling uphill.